Today, project management is a key discipline to enhance one’s career growth across all sectors. 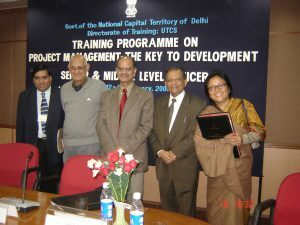 CEPM has been providing top-rated project management related training for close to two decades. We have conducted over 500 workshops / seminars in India and outside India and have trained 30,000+ persons on project management. We provide both traditional face-to-face classroom training as well as internet based online training through our training site www.pmguruonline.com. We have also provided training in association with leading companies / associations such as Microsoft, CBIP, SCOPE, IICA, PHD Chamber of Commerce etc as well as academic institutions such as IGNOU, IMT Ghaziabad, IMI, IIM Calcutta, University of Chicago center in Delhi etc. This covers both in-company training workshops where we conduct training for the employees of a company as well as public training workshops where any person can register. For in-company training workshops the venue is selected by the concerned company which can be any where across India, Asia and Middle East. Our Trainers travel to the selected venue. We charge a faculty fee + travel and stay expenses on actuals. All our Trainers are top-rated with 20+ years of professional experience in managing projects. Companies where we have conducted in-company training includes alrge number of public and private sector companies. Public workshops – we regularly organize public workshops across India independently as well as in association with associations / companies such as Microsoft, CBIP, IICA, Petrotech, Petrofed etc. Since 2003 we also offer internet based online training through our training site www.pmguruonline.com. This site is used worldwide. This is a new feature started by CEPM in 2017 that goes much beyond just providing training. Aim is to first enhance the PM skills in the organization through Training followed by Certification and then Consultancy to first discuss problem areas in work place and how to make improvements in the work place based on new learnings followed by implementation of some prioritized recommendations.